During the Arab Spring, the key to toppling oppressive regimes was mass mobilization against leaders like Ben Ali and Mubarak, whose families controlled state resources and institutions. Mass mobilization has rarely functioned this way in sub-Saharan Africa. Although West Africa has experienced two regime changes in the last three months—in Mali and Guinea-Bissau—both were fostered through military coups, not widespread citizen mobilization. Moreover, regimes in Burkina Faso and Senegal—where riots and protests did occur—have not collapsed. Currently, even Senegal, where power recently changed hands, remains quasi-authoritarian, yet it is the only one of the group of countries above in which an electoral transition followed popular mobilization. In March, following a campaign season rife with state-sponsored violence, intimidation, and suppression of protests, former president Abdoulaye Wade of the Senegalese Democratic Party (PDS) peacefully handed power over to Macky Sall, an ex-PDS politician who now heads the Alliance for the Republic party (APR). Senegal’s recent mobilization is rooted in Wade’s pursuit of a constitutionally questionable third term. In summer of 2011—roughly six months after the Arab Spring began, and two months following strikes in Burkina Faso calling for the resignation of president Blaise Compaoré—Wade proposed a law allowing presidential candidates to win the election with only 25% of the vote. He also sought to establish a president-vice presidential ticket, allegedly in order to run with his son, Karim. Wade’s propositions generated opposition, especially in Dakar. Alioune Tine, President of the African Assembly for the Defense of Human Rights (RADDHO), organized opposing parties, movements, and unions into a group called Touche Pas à Ma Constitution! (Don’t Touch My Constitution!) Citizens’ movements like Y’en a marre (Fed Up With It) also protested independently. These groups became the “June 23 Movement” (M23). As the National Assembly considered Wade’s amendment, PDS elites evacuated the downtown area of Dakar and protesters faced police and tear gas. Soon afterwards, Wade retracted his propositions. The M23 had saved the constitution, but Wade still insisted on running for a third term. 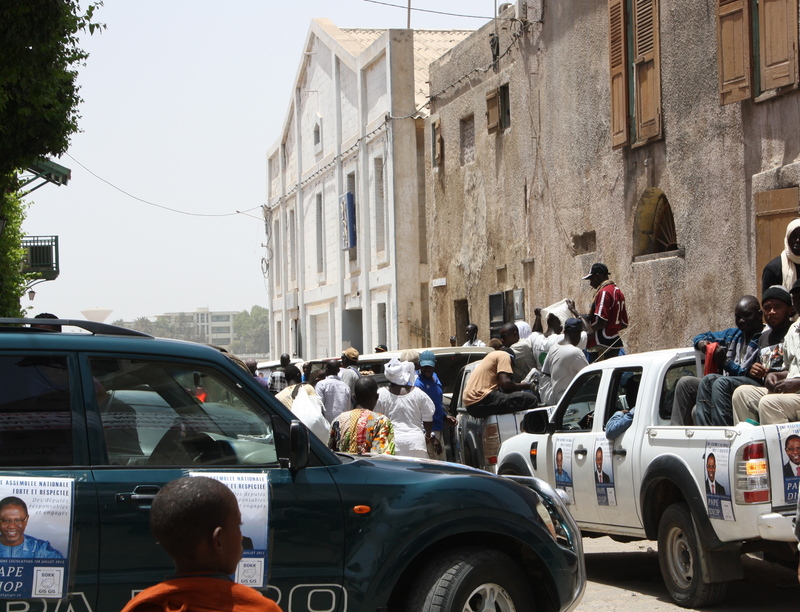 The one-year anniversary of June 23 arrived during Senegal’s campaign for the July 1, 2012 legislative elections. The M23 sponsored gatherings at Independence Plaza and the National Assembly. Y’en a marre’s rapper-leaders ended their one-year musical “sabbatical” to protect the constitution, holding a concert and promoting future projects like “pharmacies for the people…one house-one tree, and…peace in Casamance” (the latter is a region in Senegal with a long-standing separatist movement)1. What might the June 23, 2011 mobilization mean for Senegal’s democratization in the long-term? The electoral transition will not necessarily deepen democracy. Senegal has a longer history of elections than most other African countries, yet its leaders have still been quasi-autocratic. Under Wade and his predecessors, the government packed state institutions (like the Constitutional Court) with supporters of the president. It harassed opponents, journalists, and protesters. Wade’s Division of Criminal Investigation functioned like a secret police, interrogating and detaining “threatening” individuals. His victory in 2000 ended forty years of Socialist Party rule, but this turnover did not prevent him from subsequently employing heavy-handed practices. Hence, it is paradoxical that the media presented Wade as a committed democrat when he accepted defeat in 2012. If we use a more exacting definition of democracy—one which includes not just competitive elections but unfettered civil liberties, opportunities to meaningfully challenge incumbents, and little presidential abuse of state resources­—Senegal has not yet made the cut. It is still too early to gauge democratization under Macky Sall, who is approaching his hundredth day in office. What we do know is that since 2007, Senegalese citizens have accessed new means of political participation. Citizens’ movements increasingly compete with political parties for the moral authority to ensure government accountability. And everyone was invited to attend town hall meetings by the Assises Nationales, a group of opposition parties, movements, and unions that discussed Senegal’s problems with citizens throughout the country and issued a detailed report suggesting economic, political, and social reforms that future governments should implement2. The results now shape platforms of key politicians, including President Sall. Despite all the changes that Senegal has experienced over the past year, one thing remains the same: the general conviction that the president deserves a legislative majority to implement his program. Although voter participation in the legislative elections was low (about 37%), those who turned out did so largely in favor of Sall’s Benno Bokk Yakaar (United in Hope) coalition, which will now enjoy a significant majority in the National Assembly. Senegal’s upcoming legislative session will certainly prove to be a test for the country’s increasingly visible citizens’ movements, which will be under pressure to show their willingness and ability to hold politicians accountable. If they succeed, Senegal could chart a pathway to better government that, unlike some of the Arab Spring uprisings and recent African coups, entails mobilization without violent regime change. My hopes and prayers go out to the wonderful Senegalese people, with whom I lived and worked with during 1963-64. I am happy that for all of the decades since Independance, they have somehow avoided bloodshed and have maintained a democracy; which like our own, has experienced some troubled times. My best and fondest wishes for their future. Interesting article that that deals with many political issues in Senegal. Have been researching the Y’en A Marre social phenomenon and have come up with several questions that deal with fundamental questions about social revolution, political leadership and democracy. The Y’en A Marristes, as they are now called in Senegal, though they sparked the social outcry against incumbent President Wade and somewhat triggered political alternation, yet their leadership has to be cautiously scrutinized. Are, they Y’en A Marristes, aware of the fact revolution is all about contradictoriness? Are the Senegalese people really ready to set afoot the New Type of Senegalese? …..